Maybe it's the color palette or maybe it's the sweet, nutty flavor, but I think winter squash are perfect for Fall dishes. After all, pumpkin pie is one of my favorite Fall desserts. When it comes to making winter squash for dinner, most of the time I roast it. This week I felt creative and tried something new. I whipped up an easy side dish with some sauteed delicato squash. 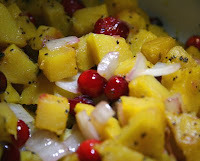 Ingredients: 2 medium-sized delicato squash, half a yellow onion-diced, 1 cup whole fresh cranberries, 4 tablespoons olive oil, 2 pats of butter, 1 teaspoon dried sage, 1/4 cup maple syrup, salt & pepper to taste. 1. Peel the squash. Cut it open and scoop out the seeds. 2. Dice the squash flesh into about 1/2 inch pieces. 3. Heat a large saute pan over medium high heat. 4. Add to the pan 2 tablespoons of olive oil and 1 pat of butter. 5. Once the butter is fully melted, add the squash. Season with salt and pepper. 6. Cook, stirring occasionally, until the squash is lightly browned and tender, 10 minutes or so. 7. Remove from the heat and transfer the squash to a large serving dish. 8. Return the pan to the stove and add the remaining olive oil and butter. 9. Heat until the butter is fully melted, then add the diced onion, fresh cranberries and dried sage. Season with salt and pepper. 10. Cook until the onions are translucent and the cranberries have slightly burst from the skins. 11. Return the squash to the pan and add the maple syrup. 12. Stir until all the ingredients appear well combined and the squash is warmed through. 13. Remove from the heat and transfer to a large serving dish. Alternate Ideas: Try this recipe with butternut squash. Add some toasted walnuts or pecans for crunch.